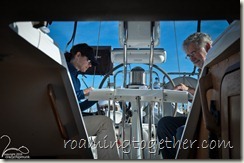 Our path towards being able to rent bareboat charter sailboats is steadily progressing. 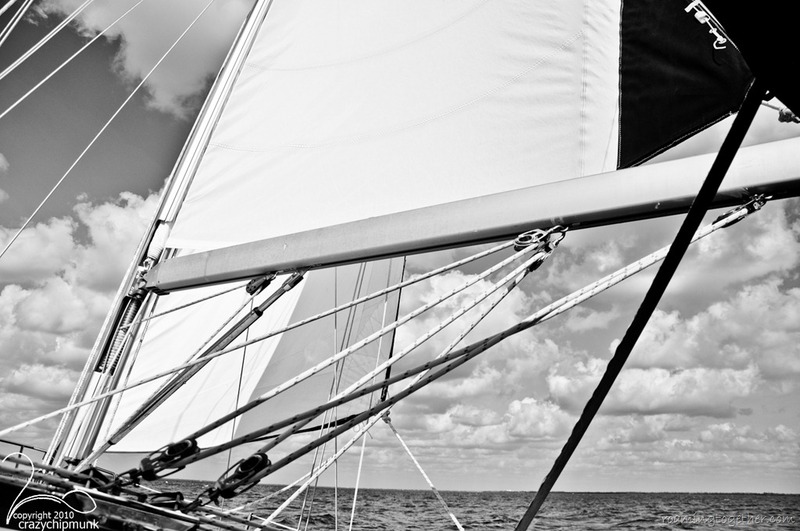 We scheduled the series of American Sailing Association (ASA) classes which will give us the ability to rent charter boats anywhere in the world upon completion. 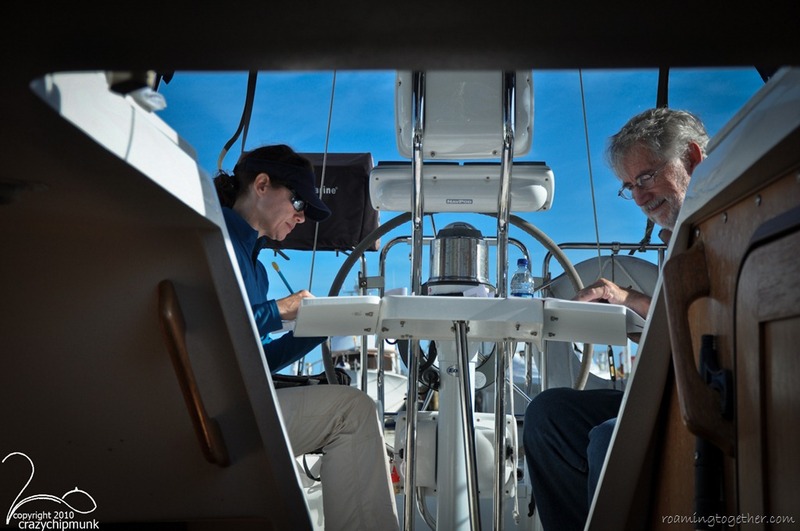 We quickly blew through the 101 course, as we and the other student Jim (the other other Jim) all had substantial boating experience and we all did our prep work by reading through the course manual during the weeks leading up to class. 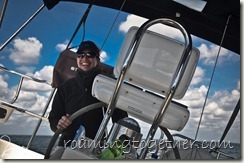 Classes are at Charlotte Harbor Sailing School with Captain Tim Benson. Soft-spoken with an incredible reserve of patience, his mannerism helps calm any jitters when you feel like things are starting to go wrong or you’re in a high-stress situation like docking the boat with in a side wind. Most of our friends and family would consider this a nice day, especially those who are currently stuck in the arctic tundra of the frozen north. 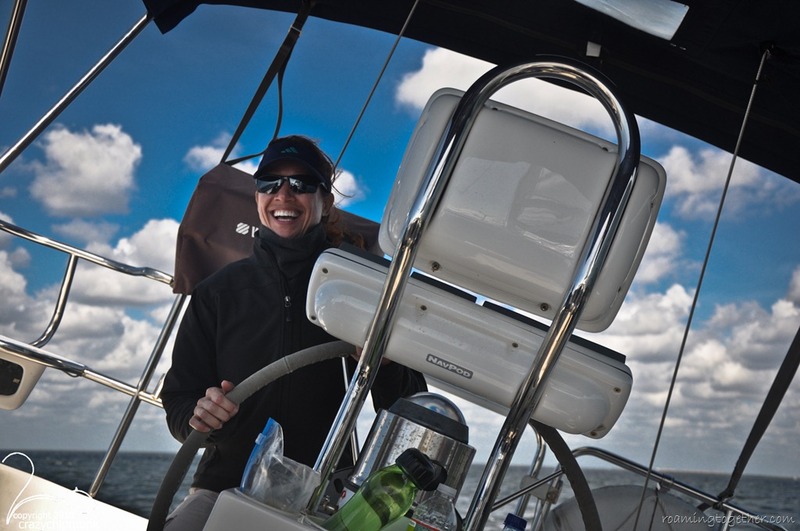 However when it’s 49 degrees in the morning and the day’s plans consist of spending the majority of the day on the water with sailing lessons , it’s time to bundle up – long johns, gloves and all! We met Captain Tim and our other classmate, Jim H. (yes, I sailed with Jim, Jim and Tim – it’s like my brother Darryl, my other brother Darryl, and my OTHER brother Darryl) at Fisherman’s Village Marina in Punta Gorda. After a quick intro and terminology round-robin, Captain Tim was able to assess our knowledge level which helped him set the tone for the day. 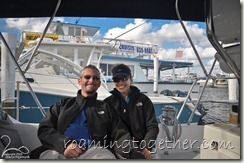 We motored out into Charlotte Harbor on the Catalina 310 "Nauti Dreams" to practice some maneuvers under power, get feel of the boat, its responsiveness, etc. What little wind we started with diminished until the water was nearly like a mirror. Hmmm, this can’t be good for sailing lessons. 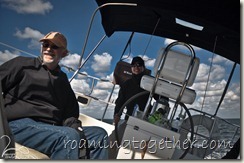 We killed the motor and had some "classroom" time with more terminology and theory of sailing. 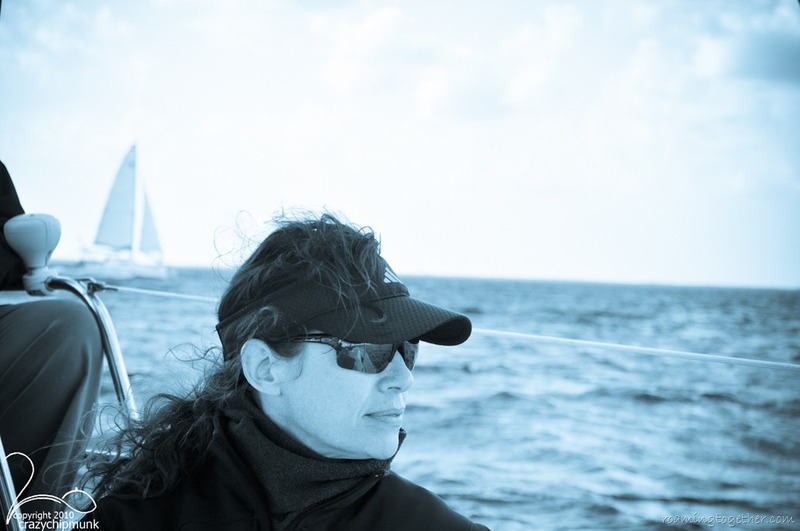 That was just the pause we needed as we ended up with 13 – 15 knots (roughly equivalent to mph) in the afternoon, creating the right conditions for each of us to take the helm through all the points of sail as we criss-crossed the harbor. Even though the sun was out, we were thankful for every layer of clothing we dug out that morning! A packed marina with the King Fisher Fleet tour boat dropping off the day cruisers and picking up the sunset cruisers is not the ideal place (for me) to practice docking maneuvers. Let’s face it – with my limited docking experience, what place IS going to be ideal? We each took turns demonstrating our ability to bring the boat into the slip and safely back out while under power and not causing any damage! Whew, I was glad that phase of testing was over. With an easy smile and peaceful demeanor, Captain Tim quickly dissipated any anxiety I might have had throughout the day. I don’t think I’ve ever heard some say "a little more to the left" with such calm – even if you’re heading straight for a piling. We were cold and tired at the end of the first day. 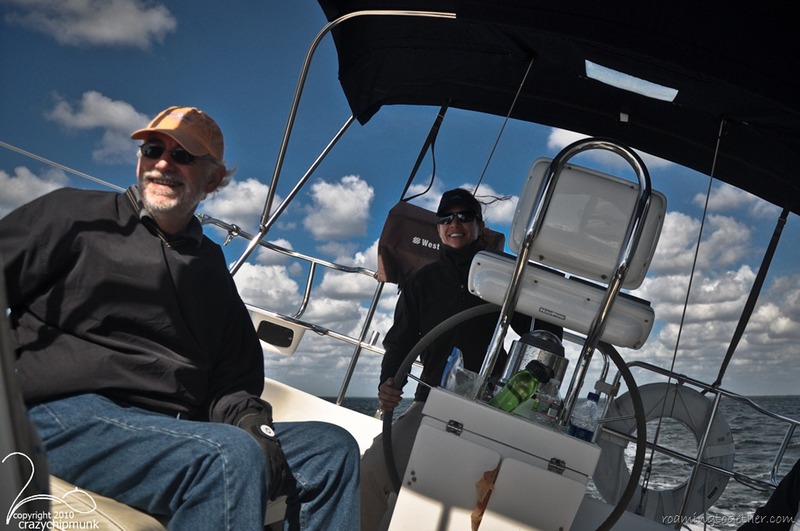 Still, we couldn’t pass up the opportunity to join Captain Tim on a Charlotte Harbor Sunset Sail with Peter (completing his ASA 106) and two guests. Friends and family know the powerful effect fresh air has on me: after a day in it you can stick a fork in me because I’m done! Sleep came very easily after a long hot shower and dinner. Lunches packed and layers on, we were out the door by 8:30 a.m. for another day of lessons. Warmer and windier was the theme for today. 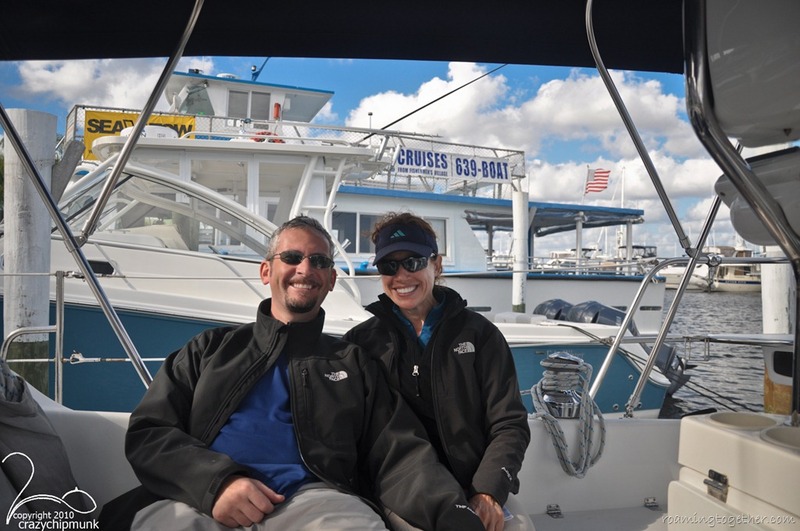 Once we completed the multiple choice test (taken on the boat – the classroom really IS the boat! ), the rest of the day we honed our practical skills as we each took turns at the helm and trimming main and jib sheets. Twenty-three knots was the strongest wind we saw on the anemometer display and at one point at the helm I exclaimed, "Wow, this is work!" "But," Jim H asked, "do you love it?" I took a quick inventory: eyes are dry, face is wind burned, lips are chapped, body is sore. 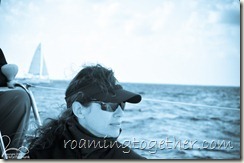 Between the wind gusts and the waves it’s a struggle to demonstrate I am able to keep the boat on course. "Yes, I do," I said with a smile. We were thankful again for each layer of clothing and every morsel of food we brought. It’s a strange phenomenon, but being bounced around a boat seems to burn up quite a bit of energy, whether at the helm, on a winch, or just sitting there trying to stay on the bench. It was reassuring when Captain Tim told us most locals would not be sailing on a day like today. 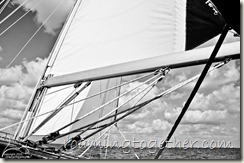 It’s just not fun to go out and get tossed around, when there are so many good sailing days throughout the year. ASA 101 is under our belts, 103 and 104 are on the close horizon, and we’ll be licensed by the end of February!